The reason I changed my website to a blog was to allow me to share our experiences since moving to a smaller home, moving to the country, and striving to live a simple life! We have had so many adventures over the years. My husband and I will dream up an idea and no matter how inexperienced we are, we will give it a try. We usually come up with an idea and when we ask a true craftsmen to do the work, they don't see our vision. So the end result is to just do it ourselves. I feel like we are always in project mode. Just can't turn off the ideas! This may be our best idea, that didn't go at all as planned. Here's how this story began. When we sold our previous home, we had many items that were not going to fit or work well in our new smaller farmhouse. However, my heart and soul had gone into making many of these pieces of junk into treasures. One of my favorite pieces was a sideboard that I had in my dinning room. This piece I picked up years ago for next to nothing. 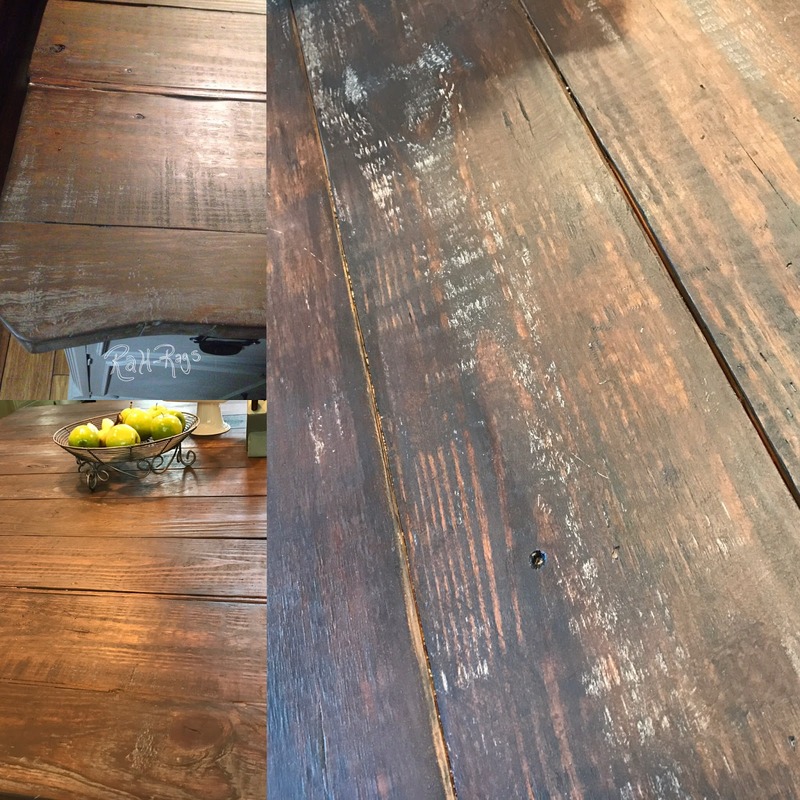 I had stripped what little finish was still on the wood and the refinished piece was one of my favorite finds. So I told my husband that I was going to save this item and maybe use it somehow in the island of our new home. So we stored it away and began construction. The top one is the original. We then ran across another sideboard (the bottom one) that I thought was the same size as my treasured piece. We were 3 1/2 hours away from home, so based on my memory, we purchased and brought it home. I thought the two pieces would be perfect to balance either end of the island and we could fill in the middle with cabinets. However, when we got home and dug into our storage unit to measure the existing piece, I was so wrong!. My husband was not a happy guy at this point. Did I tell you how hard it was to fit this sideboard into our smallish SUV. I had to hold most of our luggage in my lap for 3 1/2 hours. So.....the new sideboard was shorter in height and longer than my treasured piece. Now what to do? After much deliberation, giving up on the idea entirely, only start over again, we came up with our plan. 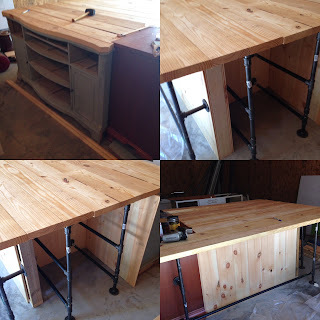 We had enough beaded board on hand, from our wooden ceiling, to the fill in around the island. 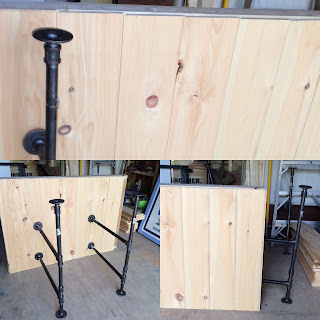 We purchased some 2x4 lumber to frame in the structure and some industrial pipe for the legs and shelving. We had to build the island in pieces small enough to transport them to the house. It was hard to see what the finished product would look like. We just had everything balanced together in the above shots. Nothing was attached yet. There were many times during the process that I really thought we had wasted our time and money. My husband and I would say to each other "well if this looks like "crap", we will just get the cabinet maker to build us a standard island and we will trash this". Thankfully we didn't have to do that. 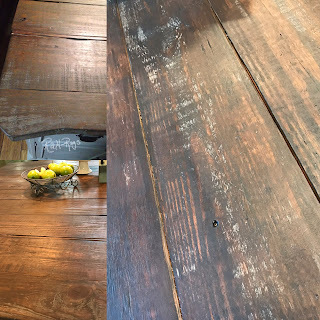 I painted the island with Annie Sloan Chalk Paint "French Linen", but couldn't make myself paint over the stained wood I had worked so hard to restore years ago. The result was to leave the drawer and door fronts stained as well as the top. I did stain over these areas with a darker stain to enrich the color. I also allowed a small amount of the blue from the purchased piece to shine through the French linen paint. You really can't see it in the picture, you'll just have to trust me. We changed the hardware on both pieces to give it an updated look. Added more pipe for towel racks. We are very happy with the result. As our guest walk around the island, they are pleasantly surprised by the slightly different feel from each side. I feel it moves from industrial, to cottage, to traditional with a distinctly farmhouse feel overall. Which is exactly what we wanted. This project didn't turn out as we had originally visualized. However, as we have found through trial and error, sometimes the best results come from an idea that went "wrong" or should I say "in a completely different direction".